This is one of those "we have the technology, so let's do it" projects, so if by the end of this description you're still wondering why anyone would want to do such a thing in the first place, then it's probably not for you. An acquaintance of mine, John Wilson, has written a very successful PDP-11 emulator, Ersatz-11, for PC hardware. One day we were talking and the topic came up of how sad it is that PCs don't have lights and switches front panels and thus it's impossible to make an emulator that really "looks" like an actual PDP-11. Well, I happened to have a KY11-D, which is the real, official, DEC front panel for the PDP-11/40, in the garage. Unfortunately I don't have the PDP-11/40 that goes with it, but that's another story! One thing led to another and eventually the discussion turned to ways the KY11 could be interfaced to a PC. The result was this project. 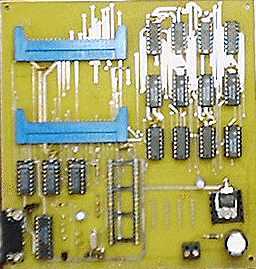 It's a fairly simple example of an 8051 controller with lots of I/O expansion to allow it to drive all the lights and switches of the front panel. All the necessary drivers for the KY11 LEDs are included on this board and everything is brought to two 40 pin headers which exactly mate with the corresponding connectors on the KY11-D. No modifications are required to the precious KY11 front panel at all - just plug it into this board exactly the same way it would have originally plugged into a real PDP-11. This interface board then plugs into a PC via a standard RS-232 serial connection, and John's Ersatz-11 cooperates with the firmware on this board to sample the switches and control the lights. The result is a PDP-11 replica that "looks" and "feels" just like the real thing. Cool, no? ?